This groundbreaking book is the first book ever to examine accounts of physiological improvements as the result of a UFO encounter. More than 100 cases are presented in which people have been cured by a UFO of illnesses and diseases ranging from the common cold to cancer. The cases are verified by UFO investigators, doctors and other officials. The book includes 186 pages, a forward by Dr. John Beresford MD, a chronology and analysis of the cases, footnotes and an index. --each chapter is accurately illustrated by award winning artist, Kesara. --includes comments and cases from leading researchers including: Budd Hopkins, David Jacobs MD, John Mack MD, John Carpenter MD, Yvonne Smith, Richard Boylan Ph.D., Brad Steiger, Edith Fiore Ph.D., Timothy Green Beckley, Jacques Vallee, Barbara Lamb MFCC, Wendelle Stevens, Leonard Stringfield, James Harder Ph.D., Ralph & Judy Blum, Jim & Coral Lorenzen and others, as well as firsthand testimonies from the experiencers. --reveals the compelling medical evidence for UFOs, including accounts of many injuries, and in a few isolated cases, death, sustained as the result of a close encounter with a UFO. --reveals that many abductees are taught by extraterrestrials how to perform psychic hands-on healing. Also reveals the many parallels between UFO healings and other miraculous healings including cures resulting from lightning strikes and religious miracles. --more than 100 true firsthand cases of healings of injuries, illnesses and diseases including: AIDs, arthritis, asthma, burns, cancer, colds, diabetes, diptheria, flesh wounds, infertility, kidney stones, liver disease, multiple sclerosis, muscular dystrophy, myopia, pneumonia, polio, tuberculosis, yeast infections and many more. Are extraterrestrials are friends or foes? What kinds of ETs are healing people and why? What do these healing cases say about our own medical knowledge and technology? If ETs can heal people, than why do so many people die of disease? These are the questions this book will attempt to answer. Read for the first time the compelling evidence that aliens are, in fact, curing people all across the world, and have been doing so for more than seventy years. Ever since the modern age of UFOs began in the late 1940s nearly every aspect of UFOs has come under intense scrutiny. Today, UFO research has become specialized. There are books on abductions, books on UFO propulsion, books on the government cover-up and so forth. One aspect that has been largely ignored, however, is the positive medical effects of UFO encounters: in other words UFO healings. UFO healings are nothing new. In fact, virtually every major UFO investigator has uncovered these types of cases. Budd Hopkins, John Mack MD, and David Jacobs Ph.D., arguably the three leading UFO abduction investigators, all admit that extraterrestrials do, in fact, heal people. As can be seen, the healing of an illness is a consistent symptom of a UFO encounter. Brad Steiger, Richard Boylan Ph.D., John Carpenter MD, Antonio Huneeus, Ralph & Judy Blum, James Harder PhD., Jim & Coral Lorenzen, Kevin Randle, William Hamilton, Jacques Vallee, Michael Hessemann, Timothy Green Beckley and Leonard Stringfield are all well-known UFO researchers who have investigated UFO healing cases. Edith Fiore Ph.D. says that fully one half of her clients have experienced UFO healings. A further refinement of Bullard’s study comes from Dan Wright, manager of the MUFON Abduction Transcription Project. According to the preliminary statistical analysis, 11% (4 cases) of physiological effects caused by UFOs are healing cases. That extraterrestrials are curing people should come as no surprise. The central feature to most abduction accounts is the medical examination. This alone should indicate that aliens know a good deal about the human body. But when you add the obvious advanced technology of UFOs, it becomes clear that it is well within the capability of aliens to cure a large number of diseases. This is just a partial list. Many of these healings have been verified not only by the patients and doctors, but by UFO investigators and other officials. Of the 105 cures reported, 24 (22%) involve healings of fleshwounds and injuries, 16 (15%) involve healings of minor illnesses and ailments, 7 (7%) involve eye cures, 4 (4%) involve cures of the integumentary system, 6 (6%) involve kidney and liver cures, 6 (6%) involve lung cures, 31 (30%) involve cures of serious and/or chronic illnesses, and 11 (10%) involve cancer cures. 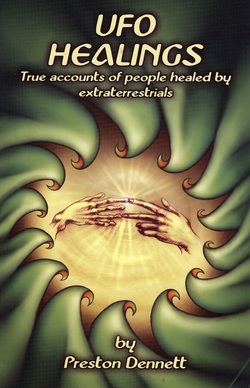 There are several well-known cases of UFO healings in the literature. The following case is probably the most famous of all UFO healings. CASE #017. On September 3, 1965, two police officers, Patrol Deputy Robert W. Goode and Chief Deputy Billy McCoy were driving along Highway 36 South in Damon, Texas. The two officers were returning from a high school football game. Deputy Goode was suffering from a painful although minor injury. He had been bitten on the left index finger by his son’s pet baby alligator. The finger was red and swollen. There are many other very well-known cases, including an anonymous French doctor who was cured of a fleshwound on his ankle and partial paralysis; an anonymous Peruvian official who was cured of rheumatism and myopia; an Argentinean who grew a new set of teeth after his encounter, and the daughter of a Brazilian official who was cured of cancer. Interestingly, in each case the witness was cured by an unusual beam of light. However, rather than cover additional cases which have already been widely publicized, I will concentrate on the cases that have received little or no publicity. Cures of fleshwounds is only one category. There are cures involving virtually every part of the body. For example, in the following case, investigated by Bob Teets, author of West Virginia UFOs, a man was cured of dental problems. Another very interesting case of a UFO healing was witnessed by close to a hundred people. It is the only case I was able to locate in which an animal received a UFO healing. CASE #013. One summer afternoon in 1959, in Pleasanton, Texas, Susan Nevarez Morton, who was thirteen years old at the time, went to attend a cockfight with her sister and brother-in-law and their family. The entire group drove to the secret location and joined a huge crowd of people of wooden bleachers. In the center of the crowd, two roosters began to fight a battle which Susan knew would be to the death. The crowd became extremely agitated, until, after a few moments, the beam of light retracted inside the object. Then the object changed from red to orange, and streaked away at high speeds. The two roosters showed no trace of their former injuries, but not surprisingly, the cockfight was canceled. Extraterrestrials are able to cure a huge variety of illnesses. One illness whose cure has eluded our grasp is the common cold. However, as we shall see, ETs can cure the cold with a simple beam of light. The following case was investigated by one of the leading pioneers of ufology, Leonard Stringfield. It is one of two cases in which people were cured of the common cold. Chuck was actually frozen in the position of trying to run away. Although he was leaning forward, he was held in position by the beam. To his surprise, a flood of strange symbols and images filled his mind. He saw mathematical equations, images of a strange planet and a kaleidoscope of strange colors. Then the beam retracted and Chuck fell to the ground. The UFO disappeared with a purple flash and a loud bang. Chuck returned to his house in a state of shock. It wasn’t until he returned inside that he noticed something strange. Before the encounter, he had been suffering from a miserable head cold. Immediately afterwards, all traces of the cold had disappeared. Chuck saw a doctor a week later, making no mention of his UFO encounter. The doctor pronounced him perfectly healthy. ETs have shown a great interest in the human eyes. There are several cases on records in which people have had their eyeballs removed from the socket and then replaced. The following case, from UFO investigator John Carpenter, is a typical example, except for the fact that there was a marked improvement in the man’s vision. The above is only one of several cases in which people noticed dramatic improvements in their eyesight as a direct result of a UFO encounter. Why these healings are taking place remains a matter of speculation. The question has divided researchers into those who feel that the aliens are healing people out of kindness, and those who believe that the aliens heal people for their own selfish purposes. The experiencers are also equally divided. The following case, investigated by longtime UFO researcher and author Brad Steiger, may be unique in the history of ufology as it not only involves a well-verified healing, but the healing occurred to a well-known UFO investigator. Even more astonishing, the UFO investigator had been told by an experiencer that he was going to have a contact. And when the contact actually occurred, it was witnessed by four other UFO investigators. CASE #019 On December 7, 1967, Danish UFO investigator Hans Lauritzen and four of his friends were conducting an active field investigation of UFOs. their research had led them to participate in routine sky watches in the hopes of observing a UFO close-up. Lauritzen had reason to believe that he might encounter a UFO in the near future. One month earlier, Lauritzen had been contacted by a Swedish girl who told him that he was on the list of the Space People as one of the people to have a contact. However, sitting out in the field waiting for a UFO was particularly difficult for Lauritzen as he was suffering from an illness that made such work very tiring. In February of 1966, Lauritzen had contacted severe liver hepatitis and had to retired and go on a pension. At the time of the UFO watch, Lauritzen was not only tired and weak, his liver was ten centimeters increased in size. Just before ending the sky watch on December 7, the five men were surprised to see two “great, dim, yellow globes about a hundred yards away from them.” Lauritzen immediately became hypnotically entranced, walked away from the group and had a telepathic communication with the UFO occupants. The conversation was about helping humanity. Lauritzen was told he had great power to help people. The following case, investigated by Edith Fiore Ph.D., involves a young boy who was cured of an extremely rare disease that would otherwise have been fatal. This case also illustrates how shockingly advanced aliens are in the field of medicine. CASE #080. At the tender age of eighteen months, “Ted” of Santa Clara, California was diagnosed with a rare congenital disorder known as angioma, which is a vascular malformation in the brain. Typically, this condition puts tremendous pressure on the brain, usually causing epilepsy. In Ted’s case, the bloods vessels in his brain were abnormally large, causing a variety of devastating symptoms. His case was so severe that doctors gave him only a few years to live. Meanwhile, Ted’s condition rapidly deteriorated. By the time he was three, he suffered from double vision and partial paralysis; he was unable to talk or feed himself, and the right side of his body had stopped growing. About this time, when Ted should have died, his condition began to miraculously improve. He was hospitalized for exploratory surgery. The surgeons, to their amazement, discovered that the abnormal tissue growth had not only stopped, but the tissues had shrunk. They were unable to provide an explanation. Years later, however, Ted discovered the explanation. Under hypnosis, he recalled being taken aboard a UFO where he was laid on a table and strange lights where shined on his head. As Ted says, “When they turn the apparatus on, a beam of light comes out. It’s very straight, and it’s very thin. It’s needle-like. It’s very much like a laser light. And it comes out and strikes my head, but it doesn’t hurt. Serious diseases seem to pose no problems for extraterrestrials. Consider the following case, investigated by David Jacobs Ph.D., in which a young girl was evidently cured of diphtheria. CASE #016. In 1972, Alice Haggerty, then six years old, was stricken with diphtheria. Because of a religious background, she had not been vaccinated against the disease. For the same religious reasons, her parents refused to take her to the hospital. The doctor pleaded, but her parents were firm. Alice got sicker and sicker until the doctor told her parents that he did not expect Alice to live through the night. Diphtheria, tuberculosis, polio, multiple sclerosis, muscular dystrophy are just a few of the many diseases cured by aliens. Nearly every organ and organ system has been cured at one time or another. The study and treatment of heart disease has made great advances in the last few decades, mainly because of a huge increase in the number of deaths caused by heart disease. There are several cases on record in which ETs have cured people of heart problems. Consider the following case which comes from UFO abductee Katharina Wilson. CASE #060. On August 7, 1989, real-estate broker Katharina Wilson or Portland, Oregon was injured by a nearby lighting strike while staying in Pensacola, Florida. She knew she had been injured by the strike, but decided to wait until morning in the hopes that her condition would improve. That night, Katharina was taken aboard a UFO. She woke up to find herself lying on a table, suffering from excruciating chest pains. As Katharina watched from a dissociated state, gray-type aliens cut a square into her chest and attached a black mechanism with several extensions to the hole in her chest. Tumors and cysts are by no means rare. Millions of people have had to deal with the shock of discovering a cyst, and then for some comes the agony of biopsy and possible surgery. However, as it turns out, there are several well-verified cases on record involving cures of tumors and cysts. One case comes from none other than Debbie Jordan, who was featured in Budd Hopkins’ book, Intruders. Debbie had been diagnosed with a cyst which disappeared in conjunction with a UFO encounter. I have also uncovered a very similar case and there are several others in the literature. One impressive case was revealed by longtime MUFON field investigator, William Hamilton Jr.
Cancer has long been one of the most dreaded of all diseases. Not only can it strike any part of the body, but it’s causes are only partially understood, treatments can be very painful, and cures are not always effective. As it turns out, however, cancer is the single disease which aliens have cured the most. This is probably because cancer can strike any organ system. In the following little-known case, a UFO abductee insists, like many others, that she was cured of cancer as a result of her UFO experience. CASE #066. Licia Davidson of Los Angeles, California, has been having UFO contacts for as long as she can remember. In 1989, Davidson was diagnosed with terminal cancer. By the time the disease was diagnosed, it had already metastasized to her colon, making it inoperable. She was given three months to live. Licia was returned to her LA home. Upon her next doctor visit, it was discovered that all traces of her cancer were gone. Licia has recovered her medical records, and states that her cure has been verified by a major medical university. She also states that she fears the United States government (who has harassed her extensively) more than she does the aliens. The above 12 cases represent only a small portion of the total number of cases. However, the above is a fairly accurate representation of the various types of UFO healing cases. Although they may sound incredible, there are simply too many cases to be ignored. One or two or even ten cases might be a coincidence, but when over a hundred cases exist, little room is left for doubt. People are being healed and of a variety of illnesses. That much, at least, is very clear. A statistical analysis of the total 105 cases reveals many unexpected patterns. The cures can be broken down into four main categories. The dates of the cures range from the 1930s to the present. 65% of the cures have occurred in the United States, but Europe, England, Russia and South America account for most of the other cases. UFO healings have usually been relegated to the realm of the contactee. However, the data shows that 45% of the cases have occurred to abductees as opposed to 28% which involve cases more properly classified as contactees. A surprising 22% of the cases involve people who have had no prior associations with UFOs. There are also patterns to the manner in which the cures are affected. 26% involve surgical operations onboard UFOs. 21% involve some type of light beam. 13% involve alien instruments held over the body, not including the surgical operations. 13% of the cures occurred apparently as the result of being in close association with a UFO. 9% involves pills, salves or medication. 5% involve injections. 5% involve healing by alien mind power. The statistics tell us many things and readers are left to form their own opinions. However, there is one inescapable conclusion to be drawn, which is that UFO healings can occur to anyone at any time.